Okay. There are dozens of new cell phone chargers that have come out in the last few years that do everything from disinfect your phone to shut down the charging process once your phone is topped up (if you haven’t unplugged it yet). They also come in all shapes and sizes now, including one that’s roughly the size of a credit card. But, there’s a new smartphone charger that’s trying to work its way into the hearts and minds of the public that comes with a nifty trick we’d normally associate with somebody like Criss Angel or David Copperfield: it makes your phone levitate. Yes, these masters of illusion aren’t the only ones with magic up their sleeves. It’s called the OvRcharge, and it’s a wireless charger than can levitate your smartphone using magnets instead of slight of hand or distraction. My first thought when I heard about this was aren’t magnets supposed to be bad for computers? I thought you could wipe your memory that way. Apparently, that’s not a legitimate concern (so much for my knowledge of electronics). The thing is, though, that this charger looks really cool when it’s in use. At first glance, it appears to be a small, polished block of wood that might serve as a stand for some type of knickknack or a trophy pedestal. Nope. If you’re someone who has to have the latest gadget or gizmo and/or are big on novelty items, this might be something for you. The OvRcharge is currently making a bid for backing on Kickstarter, where the group behind it hopes to have it out and available to the public by an estimated December 2016 release date. So far, AR Designs has received roughly half of the financial backing needed to fulfill orders and begin shipping. They’re based out of Toronto, Canada. If they aren’t able to reach their funding goal of $40,000 CAD by August 18 of 2016, you can probably forget about getting one this year. The attractive charging base comes in two sizes and three colors choices. The only difference between the two models, besides a slight difference in size, is the output current rate: the smaller is 500mAh and the larger offers 700 mAh. Both models are said to be fully compatible with all of their cases and receivers. 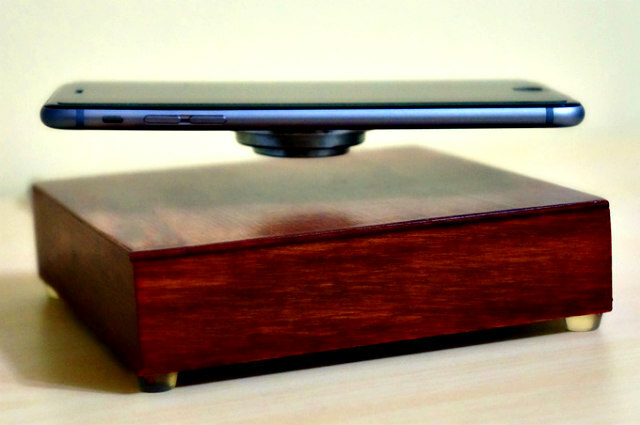 The unit is powerful enough to levitate 600 grams and charge it, so tablets aren’t a problem. You can order the bases in stains that include dark, walnut and cherry. If you’re interested in learning more about how the OvRcharge works and costs associated with it, check out their Kickstarter page for all the details.